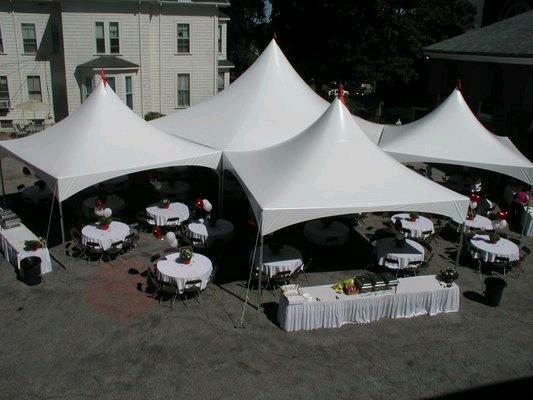 OUR HIGH PEAK TENTS COME IN DIFFERENT SIZES TO ACCOMODATE DIFFERENT SIZE PARTIES AND EVENTS. ALL OF OUR TENTS HAVE WHITE TOPS AND POLES ONLY ALONG THE PERIMETER TO CREATE A LARGE OPEN SPACE. OUR HIGH PEAK TENTS ARE THE NEWEST TENTS IN OUR INVENTORY AND WOULD BE A GREAT ADDITON TO ANY WEDDING, GATHERING OR HIGH END EVENT. SETUP AND TEAR DOWN IS INCLUDED IN THE COST OF ALL OF OUR TENTS. * Please call us with any questions about our high peak tents rentals in Lenexa KS, Kansas City MO, Shawnee KS, Grandview MO.